Botniaring race track is located in Jurva (Kurikka), Southern Ostrobothnia and it is one of the five bigger motorsports centers in Finland. The area is constantly evolving and expanding with the help of Botniaring operators and the city of Kurikka. After the extension Botniaring has become the longest and fastest race track in Finland. 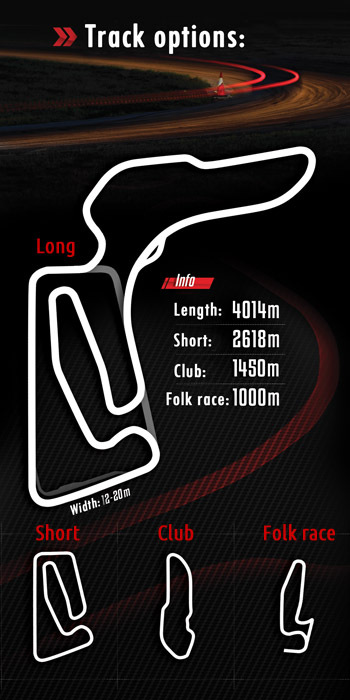 The length of the track is nowadays 4014 m instead of the former 2618 m. The track also has a high speed chicane which is one of its kind in Finland. As the track was extended the tarmac was renewed on the older section as well, so the whole track is very smooth and in good condition overall. After the extension the safety areas have been improved to match the higher speed. The extension was made in cooperation with AKK Motorsport ry and the Finnish Motorsports Union representatives to assure the functionality of the track regarding safety and driving features for both cars and motorcycles.